Aesthetic, or cosmetic-oriented, eye products on display, and on sale, in Dr. Lyerly’s office, including non-irritating eye makeup remover. Dr. Lyerly says patients appreciate the guidance on not just their eye health, but in safely enhancing the appearance of their eyes. The medical eyecare and refractive services you provide safeguard patient vision and improve quality of life. Sometimes, though, patients want something more–to look as good as they see. 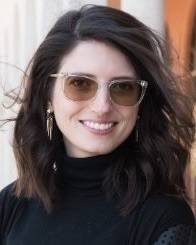 Aesthetic optometry, which offers cosmetic improvements to the eye area, offers practices a chance to provide patients with an additional, in-demand service. I define aesthetic optometry as the art of prescribing to enhance the health, appearance and performance of the ocular surface and adnexa. As optometrists, we need to own that we are the experts on everything in the eye and eyelid area. That means having an informed opinion and scientifically based advice about the safety of procedures and products patients are using on and around the eyes. The value of an eye exam cannot be limited to the numeric outcome of a refraction. 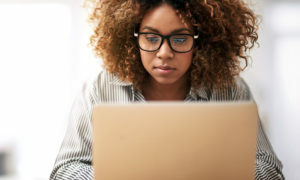 With the advent of online refractive services, it’s more important than ever to offer comprehensive ocular care where our patients can easily perceive the value of coming in for an in-person eye exam. Men and women both are seeking treatments to improve the appearance of their eyes and eyelid skin. Cosmetic Botox usage around the eyes has increased by 41 percent since 2011, and 10 percent of all Botox users are men (it’s gotten so popular it’s been dubbed “Brotox”). Our patients are seeking ocular aesthetic procedures at higher rates than ever before, and we need to make sure as eye doctors that we are seen as a vital part of that care plan. 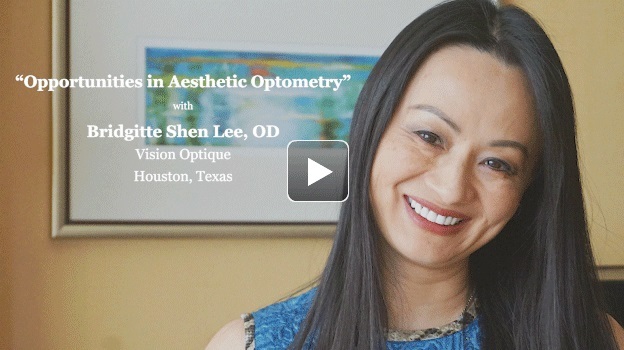 Click HERE, or the image above, to watch another ROB contributor, Bridgitte Shen Lee, OD, discuss how she incorporates aesthetic optometry in her practice. Sometimes aesthetic optometry can tie easily into services you already provide, such as for dry eye. As a dry eye specialist, offering ocular aesthetics is a natural extension of what our office does to improve the ocular surface. We recommend preservative-free tea tree oil lid cleansers for makeup removal and fighting blepharitis as a safer alternative to formaldehyde-containing baby shampoo that was a mainstay of generations past. 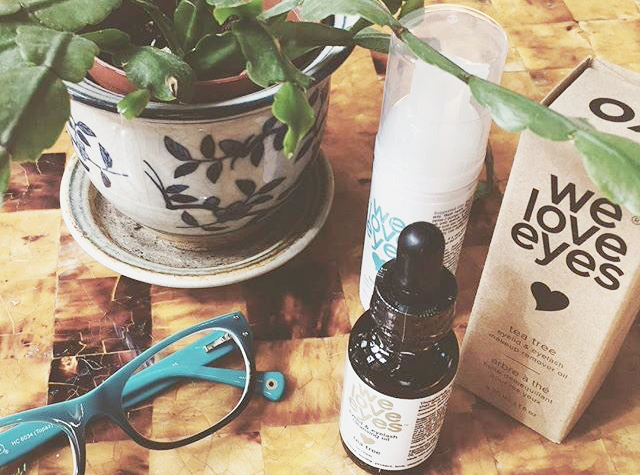 A go-to product in our clinic is We Love Eyes by Dr Tanya Gill. It’s made a huge difference for many of our patients with chronic eczematous dermatitis that were sensitive to the preservative-laden cleansers or soaps they were previously using. Baby shampoo is a huge dry eye offender, but many of our patients have been told to use this by previous eye doctors, so it’s important for us to recommend a product alternative that is non-toxic. There is no perfect mascara, but we discuss the chemicals in these products that should be avoided, and also make recommendations for more gentle options for the ocular surface. While we don’t retail mascaras or makeup products, it would definitely be an option for a doctor to look into if they found a product with ingredients they could really stand behind. We currently offer Lipiflow treatment for protecting and preserving the meibomian glands in patients who have suffered damage. Discussing the risks of meibomian gland disease with prostaglandin-based cosmetic products like Latisse, or over-the-counter lash growth serums, is a big focus in our clinic, and we offer free meibomian gland imaging at every comprehensive exam to help find patients using these cosmetic products who are at risk of developing permanent dry eye disease. Another great option, depending on the scope of practice laws in your state, would be to offer intense pulsed light (IPL) treatments for ocular aesthetics. These pulsed-light treatments improve the appearance of lid margin hyperemia by coagulating telangiectasia around the ocular adnexa, and have the added boost of improving dry eye signs and symptoms. 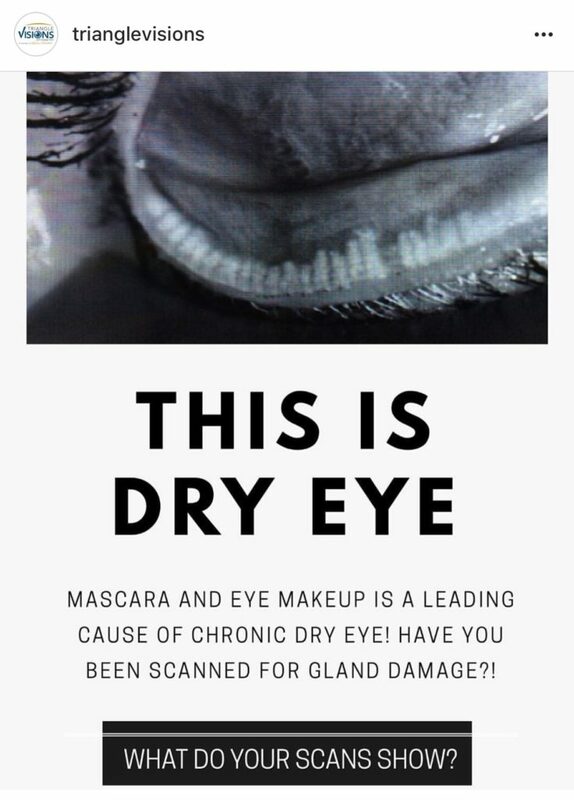 An educational poster Dr. Lyerly uses in her practice to educate patients about the link between cosmetics and eye conditions, like dry eye. Dr. Lyerly says that, in addition to cosmetic concerns, patients should be made aware of the impact of the makeup they use around their eyes. The key to elevating ocular aesthetics as a true specialty to put beside dry eye or glaucoma care is to treat it as a science. At Triangle Visions Optometry, the way we practice ocular aesthetics overlaps very much with our dry eye specialty. When we are treating dry eye, addressing the cosmetic products and procedures our patients use, and the side effects they may cause, is an essential foundation building block to their dry eye treatment. We can’t ignore the impact of aesthetics on our dry eye outcomes, so adding that specialty to our practice was essential to our patient care outcomes. As a specialty contact lens fitter, I often tell other doctors I have to be a dry eye specialist, too, to get the contact lens outcomes my patients expect and deserve. They won’t see their best, or get the best contact lens comfort and performance, without me addressing any underlying dry eye issues. The same is true in our ocular aesthetic specialty. If I treat their dry eye, but ignore the ocular surface offenders they are using on a regular basis, am I really fully treating the issue? In my opinion, it’s impossible to separate specializing in dry eye care from also specializing in ocular aesthetics. Offering ocular aesthetics as a specialty can be done with minimal-to-no investment. All it takes is familiarizing yourself with the chemical risks associated with common cosmetic and facial products, and the treatments available. As a part of routine eye exams, we get asked by patients on a regular basis questions like, “what can I do about my under-eye circles” or “what mascara would be better for sensitive eyes?” Ocular aesthetics is specializing in solving these common patient issues and questions. If you choose to retail products in your office, it can be another additional revenue source. Currently we retail HydroEyes supplements for improving dry eye and meibomian gland function. MGD and dry eye is a major side effect of ocular cosmetics and cosmetic treatments like eyelash growth seurms, eyelash perming, botox injections or retinol wrinkle creams. As a Vision Source member, our cost is around $15 per bottle, and we are able to retail it for $33 per bottle for a great return. We also retail Bruder masks for improving meibomian gland function for patients who are diagnosed with issues during the exam. We discuss the importance of makeup removal, lid hygiene with a safe cleansing product, and then heating the glands nightly to reduce the negative impact of products like eyeliner and mascara that can promote meibomian gland dysfunction. We offer Lipiflow treatments, as well, for patients with nonexpressing glands due to meibomian gland dysfunction. This treatment is FDA-approved for preserving and protecting meibomian gland function, and at this time, not covered by medical insurance. As a cash-pay treatment, it is a revenue-builder for both our dry eye clinic, and by extension, our ocular aesthetics specialty, since treating meibomian gland dysfunction is an important part of treating side effects of cosmetic products and procedures and solving underlying causes of common ocular aesthteic issues like chronic redness. If you want to jump-start learning more about the most common ocular surface irritants in cosmetic products, check out Vampires on the Vanity by ophthalmologist, Laura Periman, MD, and become a member of the collaborative OD/MD community on the Ocular Surface Facebook forum OSDocs. 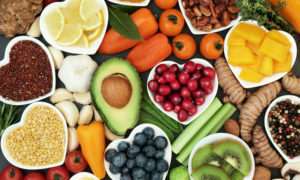 In addition, Advanced Ocular Care has done an excellent job featuring articles from the leading ocular aesthetic and anti-aging eyecare specialists around the country. Bridgitte Shen Lee, OD, Leslie O’Dell, OD, and Whitney Hauser, OD, are optometrist-thought leaders in the field. Any article or course offered by any of them always gets my immediate attention to expand my knowledge on the topic. It is essential to have all of your staff familiar with any product you retail or service you provide. 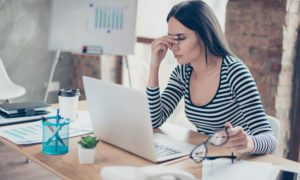 They are spending a lot of face time with patients, and they are likely to field questions or hear buzzword complaints or issues that should trigger a discussion of what you offer in the office. It’s always a slam dunk for enrolling a patient in my treatment plan when I have a patient sitting in my chair who has already heard from another staff member about how I can help them. Whether it is my technician recognizing dry eye symptoms during the work up, and seeing tell-tale meibomian gland atrophy on their imaging, or my front-desk staff documenting pertinent complaints she heard when the patient scheduled the appointment, any time a patient is primed to know I can help, they are much more receptive to the treatments and solutions I recommend during the exam. We have adapted several aspects of our exam flow at Triangle Visions Optometry to investigate both dry eye and ocular aesthetics issues. It starts with our technicians asking questions during the exam work-up: we ask about common dry eye symptoms like fluctuating vision, redness and watering. We ask about the medications our patients take and any cosmetic treatments (even over-the-counter) they use. I want to know anything my patients are putting around their eyes, including wrinkle creams, lash growth serums, eye drops and soaps. During the slit lamp exam I’m not only checking for normal signs ocular surface disease like punctate keratitis, lid hyperemia, and meibomian gland dysfunction, but I’m also observing for any tell-tale signs of ocular aesthetics issues. Are they tight-lining their eyelids? Wearing false lashes? Do they have mascara debris in their conjunctiva or on their contact lens surface? These are all conversation starters to delve into ocular aesthetics treatments and solutions. We also screen every patient with meibomian gland imaging, and if any evidence of gland atrophy is seen, we thoroughly dig into all possible offenders, including cosmetic products and treatments, and start the discussion about treating the glands with ocular surface approved lid hygiene, Bruder heat masks and Lipiflow, if needed. Displaying the products you offer is great to start a conversation. We have our HydroEyes supplements and information about dry eye and ocular aesthetics right at the checkout counter, and many times asymptomatic patients will pick up the bottle and say, “Oh my sister might need this” or “I should tell my friend about this.” It’s a great way to get more patients scheduled, offering additional conversation-starters about how you can help patients both look and feel their best. Focus Group: How Do Men & Women Differ as Practice Owners?